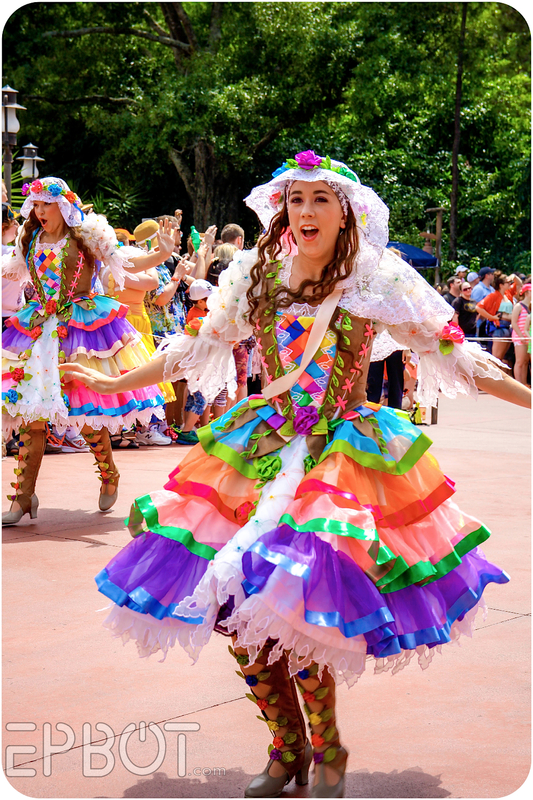 Time for some long-overdue pics of WDW's new daytime parade, the Festival of Fantasy! The men have stylized swans on their hats and tunics, and the women's dresses have side swags of feathers leading up to a high swan-neck collar. 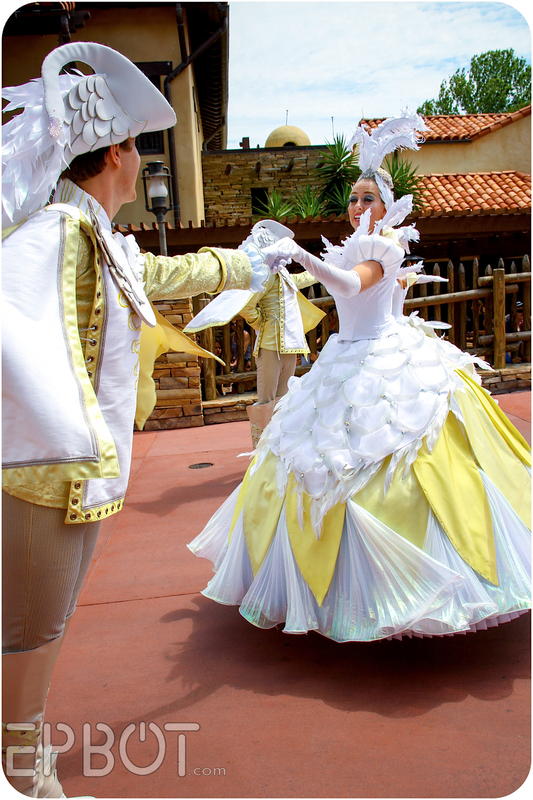 I'm amazed at how intricate the costumes are for what are essentially generic pre-show dancers. Talk about starting things off with a bang! Then, on the back two sections there are rotating platforms. 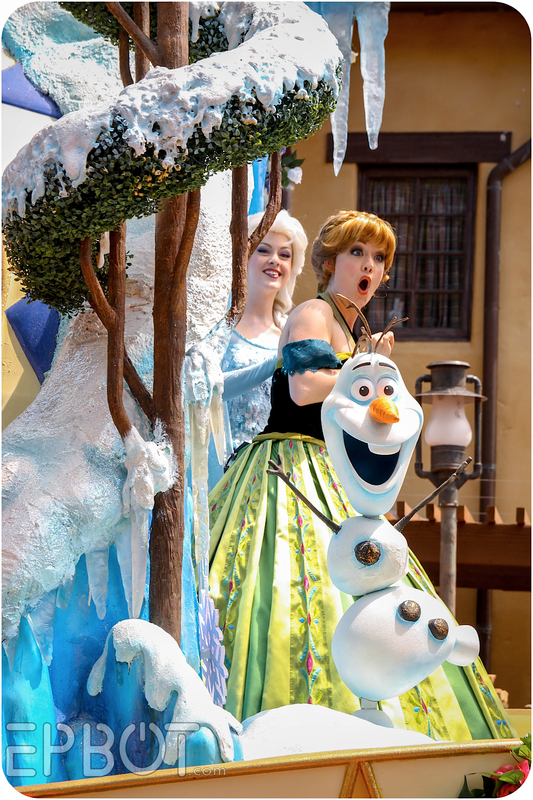 Here you can see Cinderella just spinning into view, with Elsa and Anna taking their turn in the rear. 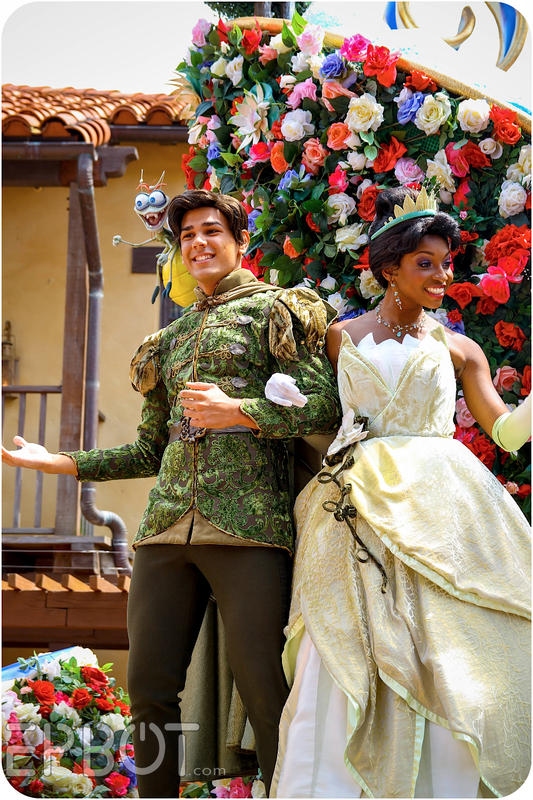 I like how Ray the firefly is peeking out over Naveen's head on the right. Ha! The rotating floats pose a slight challenge for pictures, but they also keep it fun and interesting. It helps that everything is so high, too, so you're not as likely to get the crowds on the opposite side of the street in your photos. 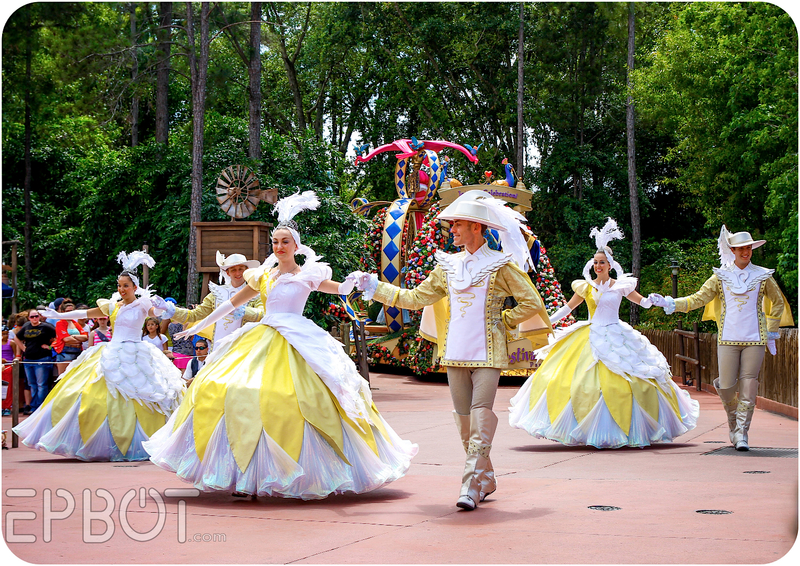 Like the Swan Dancers, these Tavern Maids are sporting some stunning costumes. The detail is incredible, and the colors & design bring back fond memories of my Lady Lovely Locks dolls. Seriously, look at all that color! I especially love the roses in the strappy boot leggings, the drop-lace petticoats, and how each skirt is a unique color combination. 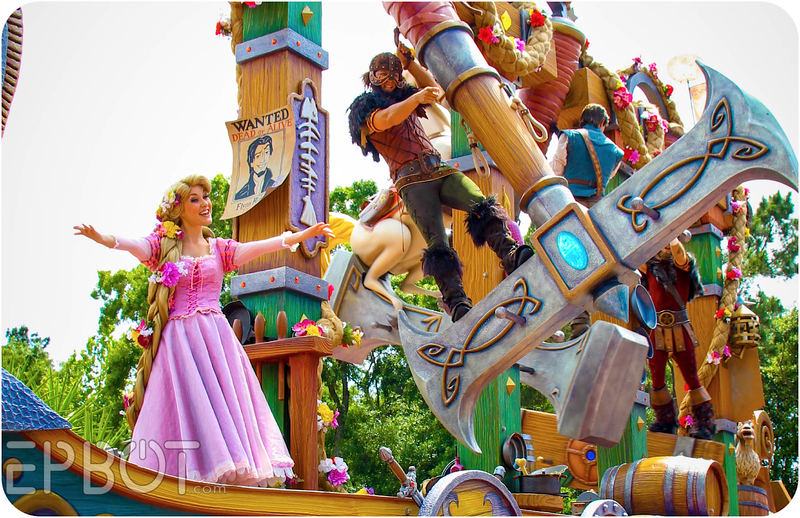 Look closer and you'll see Rapunzel's braid twined all over the float, along with tavern barrels, Flynn's Wanted poster, a goat, and... hey, do I spy a frying pan? Yep, even Maximus the horse is onboard - and looking mighty displeased to be sharing a swing with Flynn. Heh. Ready for more? Here's Part 2 and Part 3! I like! 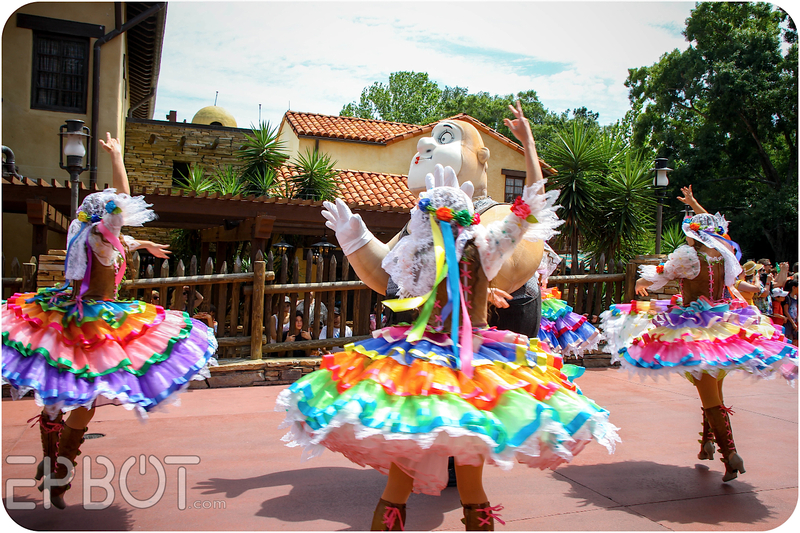 Makes me want to go to the Magic Kingdom right now! Alas, I have to wait until my vacation in September. 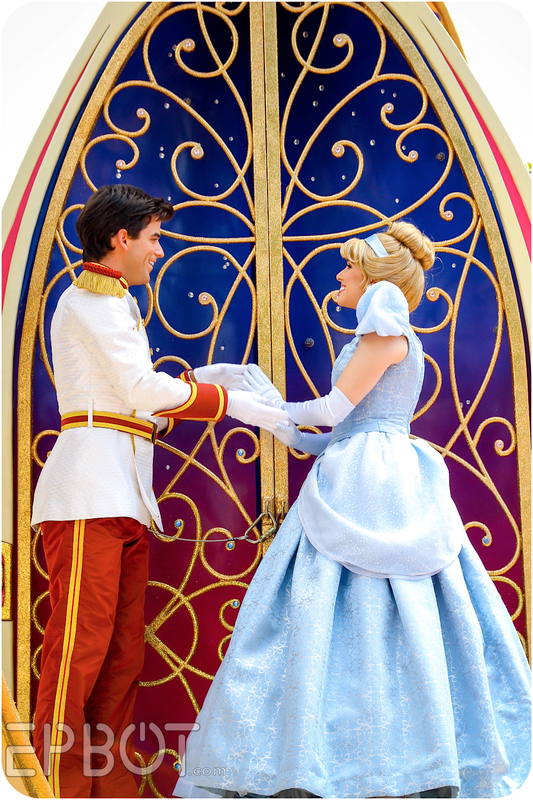 I haven't been to Disney since I was a child, and I would love to go back as an adult. Until then, I'll have to settle for living vicariously through you and your wonderful photos. 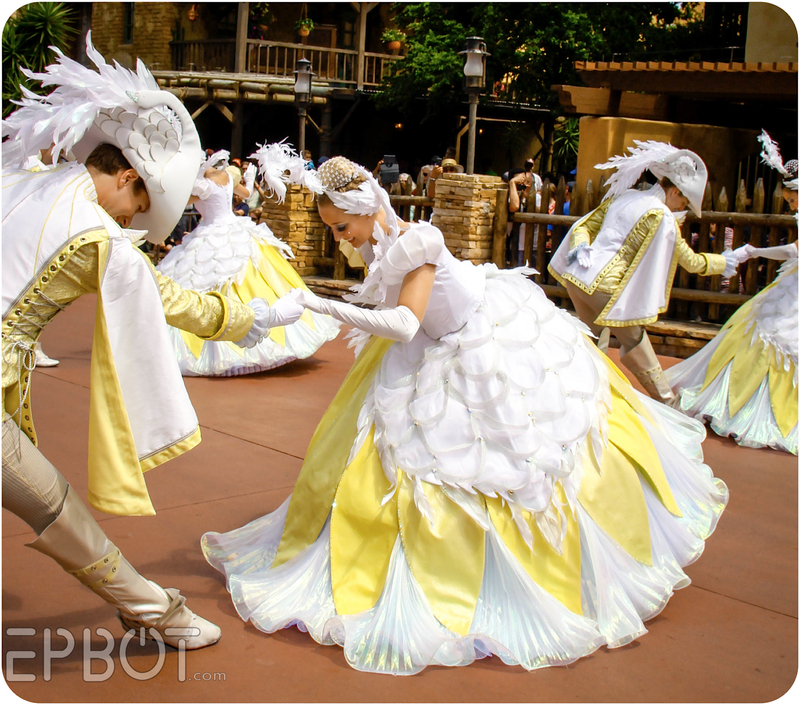 Those are beautiful photos, and make me miss Disney like crazy. Can't wait for the next installments! We were *just* there! (April 28-May1) I had never been, so at age 45, it was a wonderful vacation. My 9-year old twins (Mini-Mal and Mini-Kaylee) were tall enough to go on every ride, and had a blast! We barely had the energy to do all the rides, and there was no way I could get my husband to stand around to watch the parade with his bad back (standing around is the hardest for him). The kids and I were pretty exhausted too. So THANK YOU for all of your wonderful pictures of the things we missed!!!! Lovely pictures! I love the color and all the various angles so keep them coming. 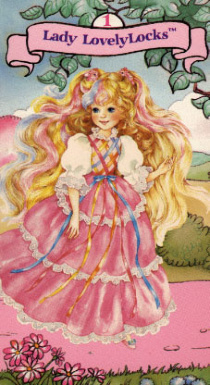 I also wanted to say I loved lady lovelylocks and remembering wearing little mutlicolored lady lovelylocks animal hair clips (with pink, blue, and yellow fake hair just like the picture) to school in kindergarten multiple times I'm sure because I wanted to be her. Happy Friday! oh my daughter needs more pictures of Flynn. ;) Thanks so much for sharing. 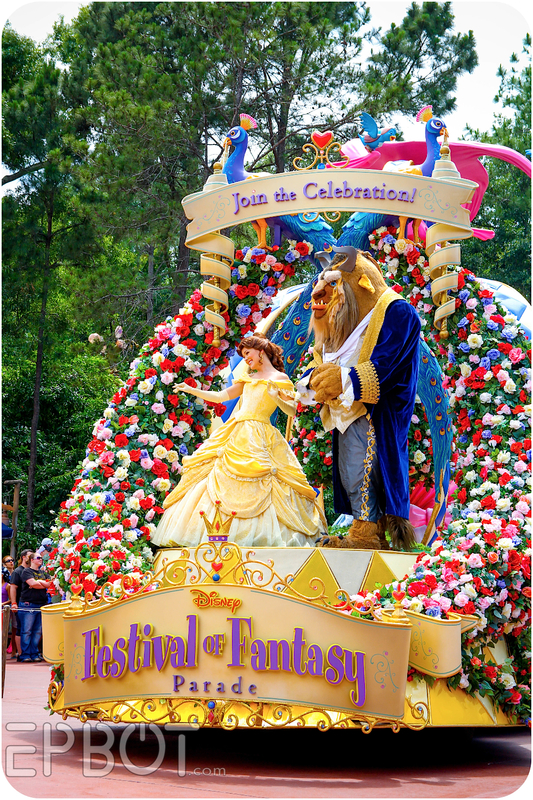 We are heading to Disney World in October and this is what I am most excited for! Your photos are always amazing, but the colors! The Colors! Just gorgeous!!!! I can't wait to see the rest! They do look like Lovely Lady Locks dolls!! Holy 80's flashback!! And as always fantastic photos! This is the kind of stuff that makes me love Disney so much. I mean... it's DISNEY, so they could totally get away with just having their most popular characters march in a single file line waving at people and kids would still go berserk over it. But they don't. They pull out all the stops, they find new ways to top even themselves, and they put together a world-class show every single time. Love. "Mind. Blown. Even 500% better than the last post. Pictures couldn't be better if she asked Disney to pose the staff in place with those expressions for 20 minutes while she analyzed every possible angle for the best picture. 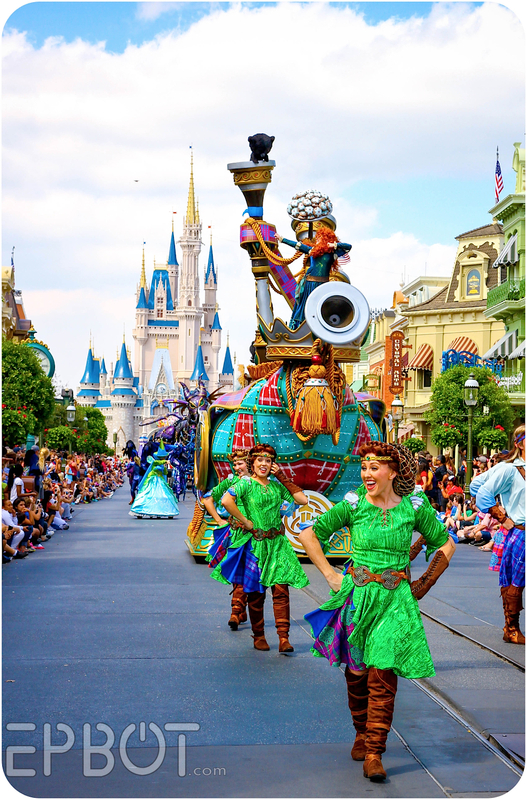 It’s insane to me that an amateur, for fun, snapping shots while a parade blasted by her at 30mph, could have pulled off ONE of those shots, let alone 19 marketing-worthy, magazine-quality pictures." Just thought I'd share. Keep doin' what you're doin', Jen. We love ya! I love these Disney posts! We went in 2011 when they were just starting the Fantasyland expansion, so we're very excited to be planning a trip back for Christmas this year. Can't wait to see all this, and my geeklings are very excited, too (15 and 11). Thanks for sharing these beautiful pictures! I had a Lovely Ladylocks! Jen, I LOVE the Disney posts, so keep them coming! I grew up near Disney and spent many happy days there, so I'm always thrilled to read about, and see photos of, what everything looks like now. I haven't been to Disney in almost ten years now, so I would love to get back to the Magic Kingdom soon to experience all the new additions. Beautiful photography and gorgeous color enhancements. 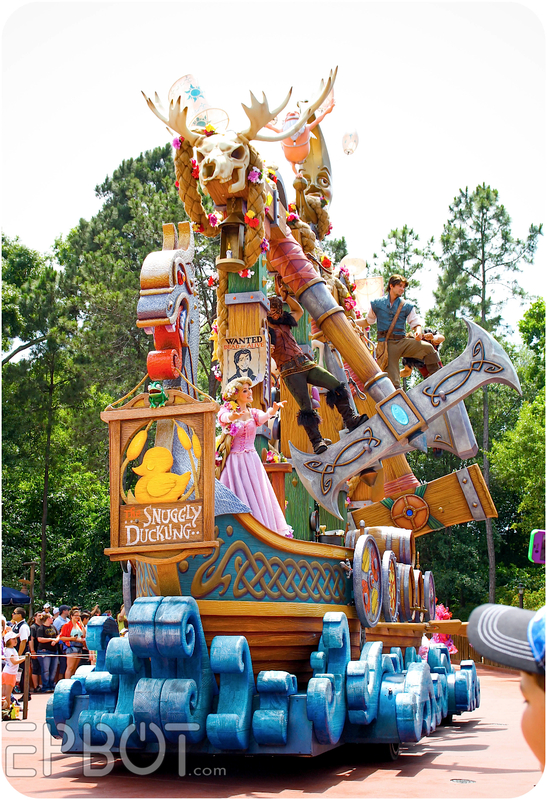 Can't wait to see the rest of the parade pics and also a post about the Pirate Treasure Hunts! I love the colours in this whole parade! And just SO pretty the whole way through. WOW! Your pics are AMAZING!! 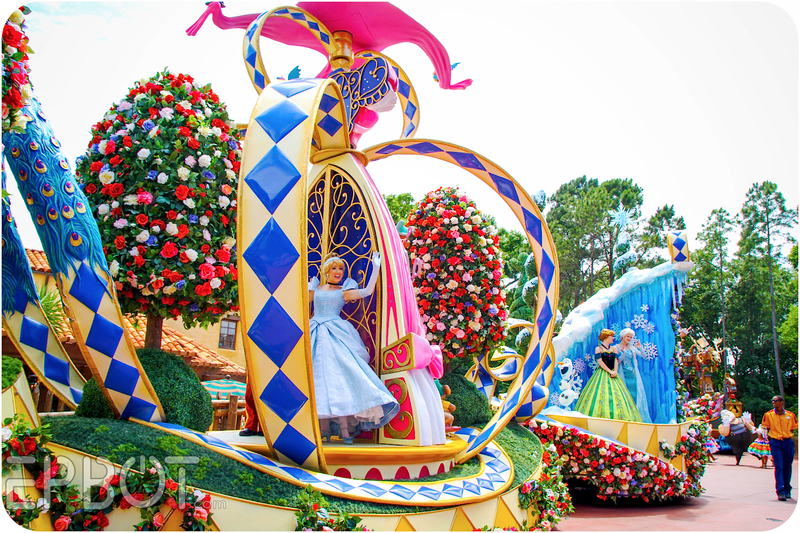 Clearly you've seen the parade a few times, judging by the various lands in which you've photographed it in!! I LOVE IT!! Ok.. so I'm probably wrong! HA! I thought you had pics from by Pecos Bill and then coming off the Liberty Square bridge into the Hub.. but on second viewing from a computer vs a phone, they're all right there in Frontierland as the parade first emerges!! The trees in the back threw me! LOL Either way, LOVE THEM ALL!!!!!!!! 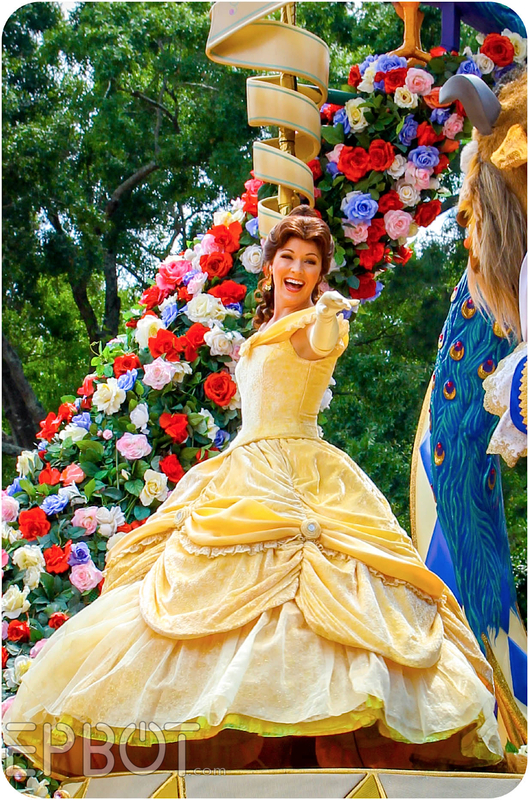 I've only seen the parade twice, Stacia, but you're right that one or two of these were from a different location - up by the flag pole on Main Street. You'll see a couple more examples from that spot in my next posts, since the castle backdrop is pretty cool! Are the guys somehow attached to the swinging axes? 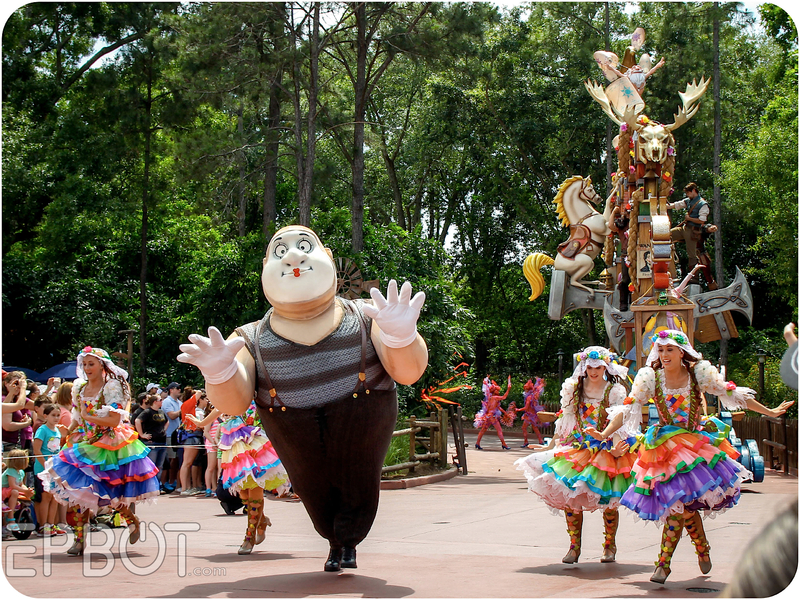 I know when I worked parade at Disney they were bonkers about safety and that seems pretty risky. I've consulted my pics and video and that's an excellent question!!! They're all hanging on to things around their wrist (you can see them in Jen's pics, there are ones above their heads and by their knees) and I watched the video we took and it looks like there's nothing else there! Hmm.. interesting! FYI, Rapunzel is attached via her hair.. lol.. cracked me up! 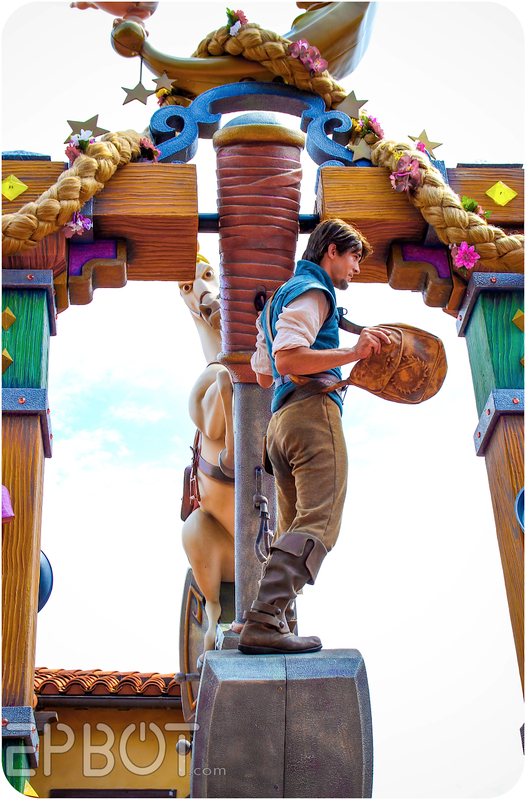 The company I work for built the Tangled float! It was so intense and it took about 6 months since when we got the float frames into the building. We also built the Little Mermaid float that was right after Tangled! Jen, I've never been to disney and I've always wanted to go (time and money have been factors in not going). 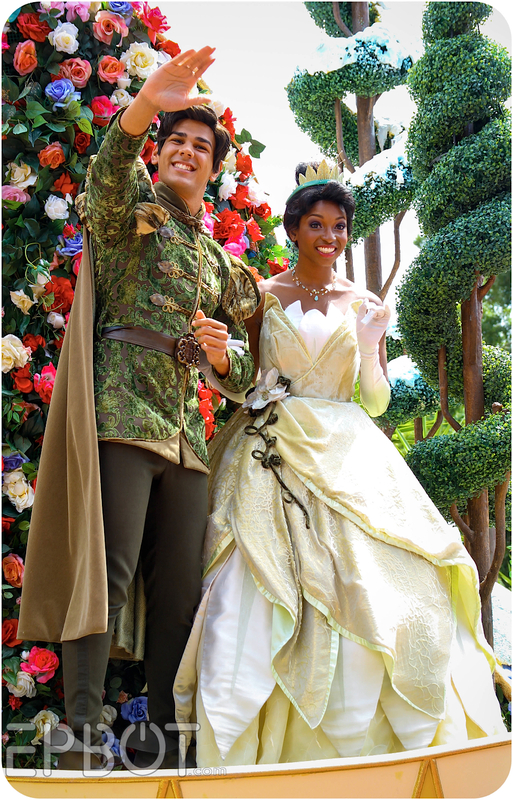 Seeing your pictures is wonderful and it feels like you're bringing the park to me. Thank you! Thank you so much for sharing! You're so wonderful for taking the time to do this! More! More!! I'm not even a Disneyphile, and I love these. 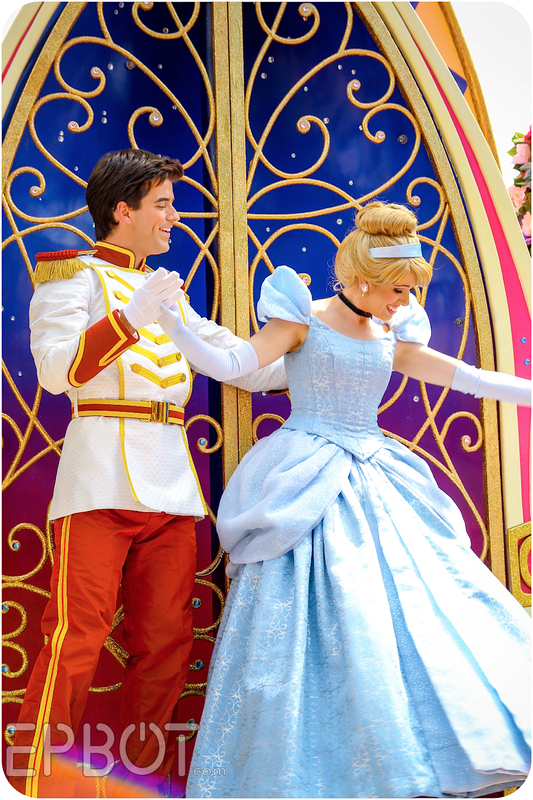 The parade is very different than the Princess parade in Anaheim. 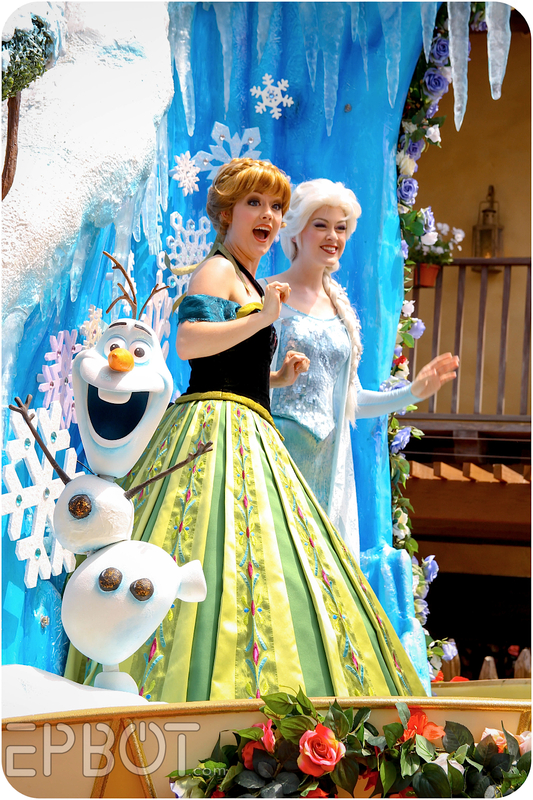 There was no Anna or Elsa and when the parade was done you could feel the slight disappointment of all the girls in the crowd or maybe that was just me being disappointed. :) I have a feeling they will add them for the summer. Thanks for helping us deprived Disneyland peeps fill in the gaps. These are gorgeous pics! !